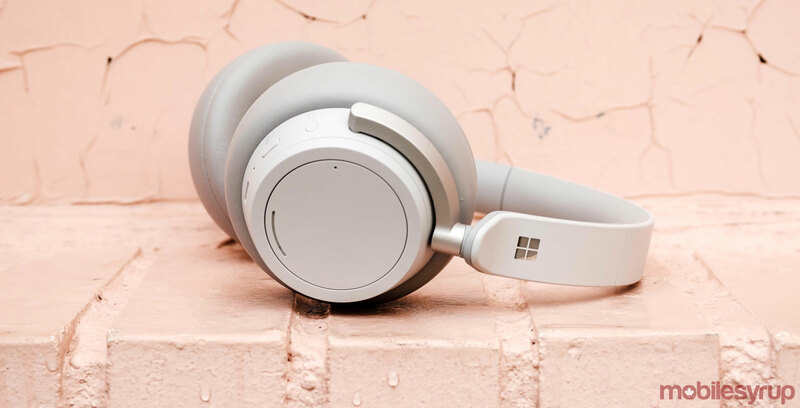 After an initial launch in the U.S., Microsoft’s first pair of noise-cancelling headphones, the Surface Headphones, are finally available to purchase in Canada. 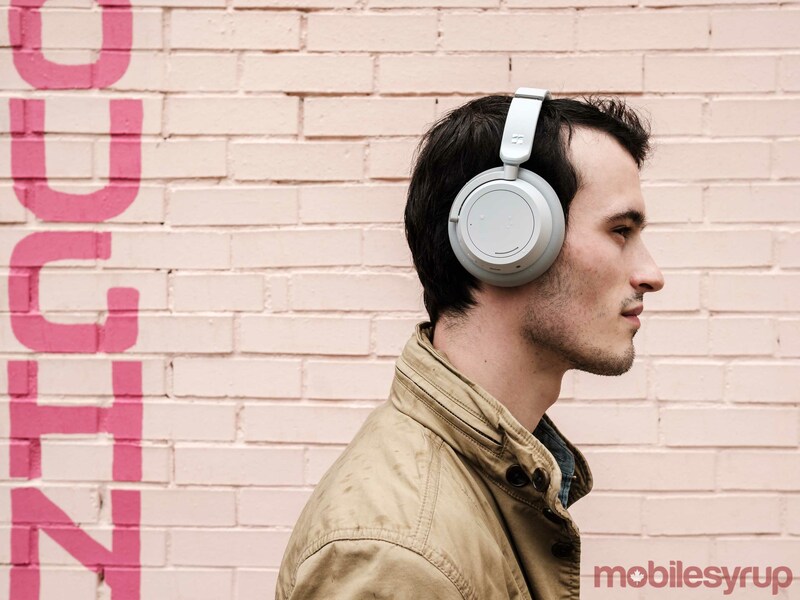 They join an incredibly competitive market dominated by old standbys like Bose and Sony. Does the new kid on the block make a compelling case to pick its offering over the, frankly, excellent competition? The answer, as usual, is tricky. 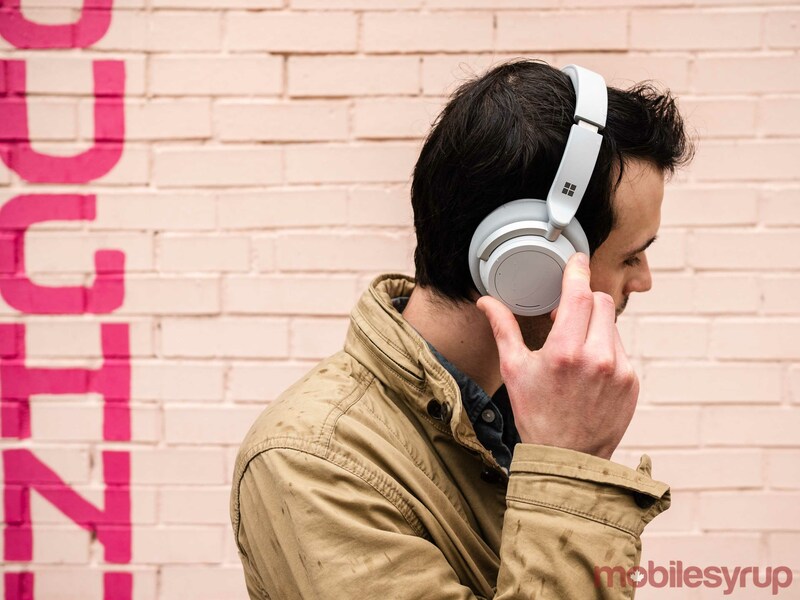 For much of this review I compare the Surface Headphones to Sony’s WH1000XM3. I do this for two reasons. First, of all the noise cancelling headphones on the market currently, I have the most experience with the WH1000XM3s. Second, by most accounts, the WH1000XM3s are among the best — if not the best — Bluetooth noise-cancelling headphones Canadian consumers can purchase currently. 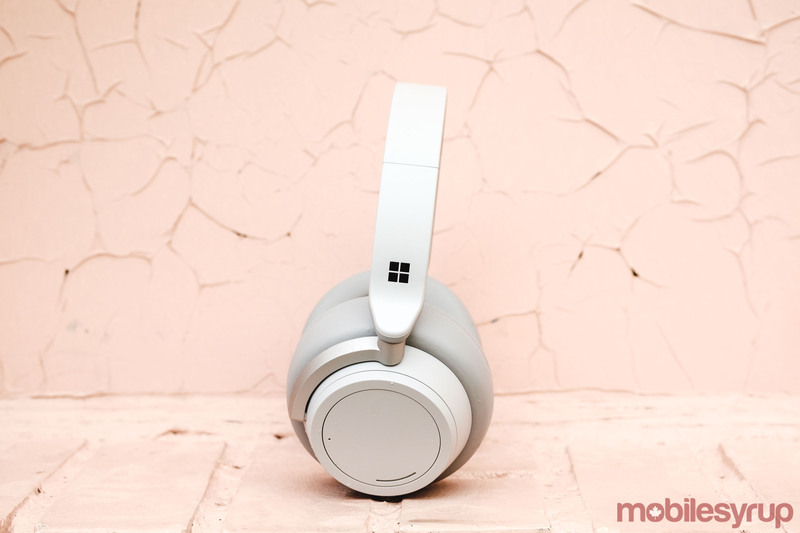 With Microsoft pricing the Surface Headphones at $450 CAD, the same price as the WH1000XM3s, they need to be better than the best to be worth a recommendation. If you’ve seen any other Surface-branded devices recently, the Surface Headphones tread familiar ground. At the moment, they’re only available in one colour, ‘light gray,’ (no handsome matte black colour just yet, alas). Like Microsoft’s Surface Pro and Surface Book 2-in-1s, the Surface Headphones feature solid construction throughout and generous use of premium materials. In particular, the headband, made from rubber, steel and high-quality plastic, stands out, as do the generous memory foam ear cups. However, there are a couple of issues I found with the design of the Surface Headphones. To start, at 290g, the Surface Headphones are heavier than both the Sony WH1000XM3s (255g) and Bose QC35 IIs (234g). They’re also more rigid than either of those two pairs of headphones. Taken together, I found these two factors made the Surface Headphones fussy to properly position on my head. There was definitely a specific way I had to wear them on my head. If I wore them in any other way, they felt either unbalanced or uncomfortable. On the subject of comfort, I found the Surface Headphones less comfortable than other over-the-ear headphones I’ve used in the past. For example, where I can wear the WH1000XM3s for hours on end without issue, I find I have to take frequent breaks with the Surface Headphones. A lot of that has to do with the fact that they felt like they pressed down excessively on my ears. 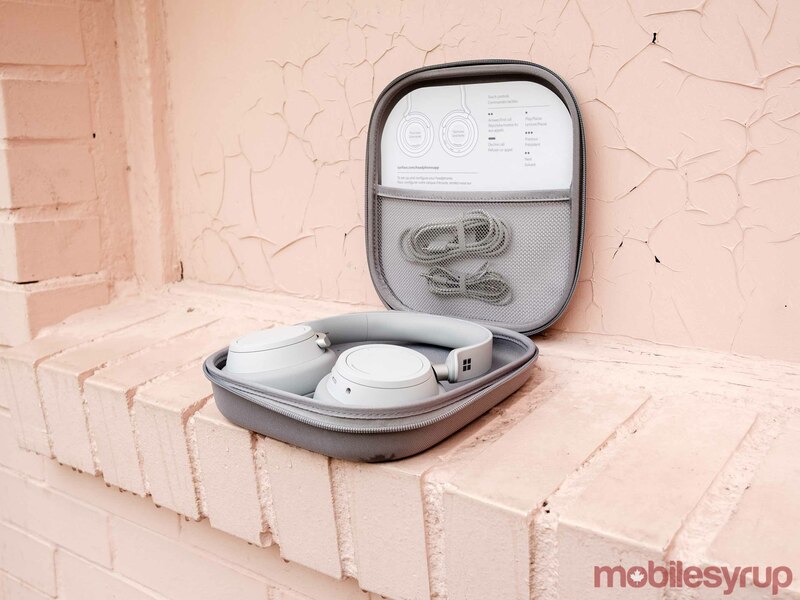 Also noteworthy is that the Surface Headphones don’t collapse down into a more compact package. This makes them less finicky to take out and put away. Conversely, they take up more space when stowed in the included carrying case. Despite the above design shortcomings of the Surface Headphones, I absolutely love one aspect of their design. Each ear cup features its own dial. The left dial allows one to adjust the level noise cancellation (there are 13 levels to choose from), while the right dial allows one to adjust playback volume. The dials make it both fun and easy to precisely control just how much volume the Surface Headphones output and how much ambient sound they let through. Best of all, they tie the two settings you’re most likely to access frequently to granular controls. I can’t stress enough how much better the experience of using a pair of noise-cancelling headphones is when you don’t have to rely on fussy touch controls — though the Surface Headphones have their share of those, too. A single tap on the exterior of either the left or right ear cup pauses and resumes playback, while double and triple taps will skip forward or back to the next song. You can also tap and hold to decline an incoming call, as well as activate, depending on the device the Surface Headphones are paired with, Google Assistant or Siri. I found the touch controls on the Surface Headphones worked more reliably than they did on the WH1000XM3s — though they could still be temperamental at times. Moreover, and this is a big positive, in the time I’ve been able to test them in cold outside weather, the Surface Headphones have worked consistently great. This is in major contrast to the WH1000XM3s, which in cold weather, start to function erratically. Microsoft promises 15 hours of battery life from the Surface Headphones. In some instances, this is significantly less than the competition; Sony says the WH1000XM3s can provide 30 hours of functionality on a single charge, while the Bose QC35IIs are rated to 25 hours on a single charge. Practically, I found this meant I had to charge my Surface Headphones far more frequently than my WH1000XM3s. I haven’t had a chance to take them on a long-haul flight yet, but I imagine most people will want to have a backup power source on hand if a trip involves multiple flights and layovers. It’s by no means a deal breaker, but it does make them less convenient. 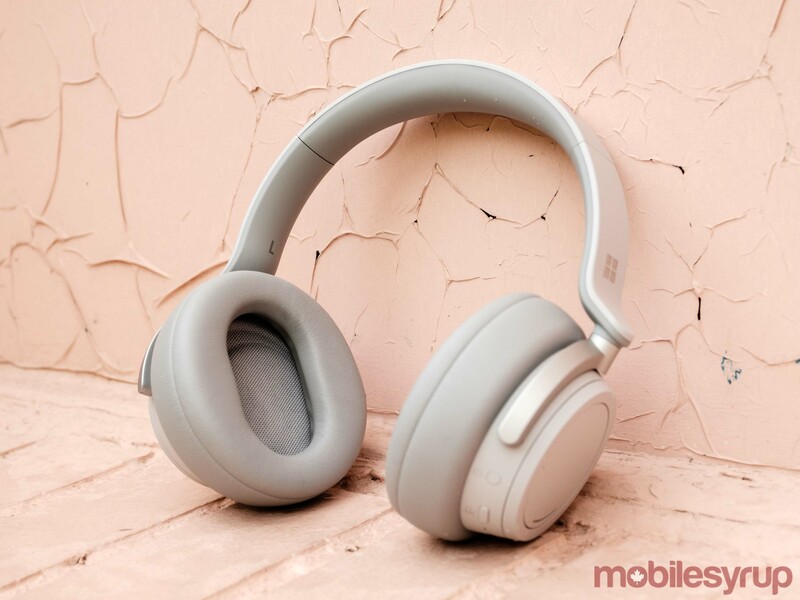 When it comes time to charge them, the Surface Headphones feature a USB-C port, which means you can easily charge them with any modern Android smartphone charger in a pinch. Moreover, in a nice touch, the charging cable Microsoft included with the Surface Headphones is a USB-C to USB-A cable, which makes it ideal for use on planes since it’s quite the ancient airplane that doesn’t have USB-A ports aplenty. For the most part, the Surface Headphones do an excellent job of keeping ambient noise to a minimum. Using them daily in MobileSyrup‘s often rowdy office and on the subway, I was able to work and read in peace. In practice, however, I found their ability to cancel out noise a shade worse than the WH1000XM3s. What’s more, the Surface Headphones have an Achilles heel when it comes to their noise-cancelling capabilities. Instead of cancelling out the noise of the wind, they amplify it, making whatever song or podcast you’re listening to currently sound like it was recorded without a dead cat over the microphone. 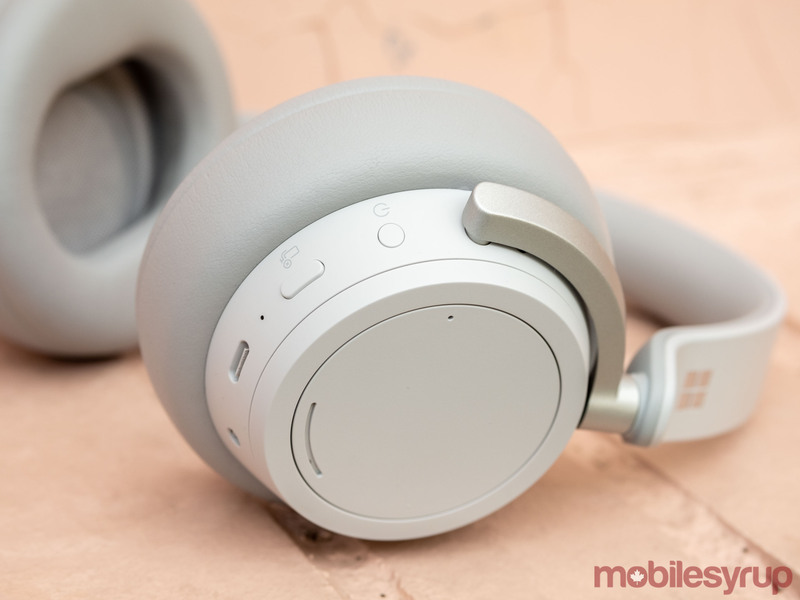 However, if there’s one major disappointment with the Surface Headphones, it’s that they don’t support advanced Bluetooth audio codecs like AAC, aptX or LDAC, nor does it appear as if Microsoft plans to update them to do so. Instead, all that’s here is SBC, which offers the most basic functionality and audio quality of all the currently available Bluetooth codecs. In its defence, Microsoft says the SBC codec has improved significantly in recent years, and that unlike ACC, aptX and LDAC, which were developed by Apple, Qualcomm and Sony, respectively, it’s not a proprietary format. All fair, but these are codecs competing noise-cancelling headphones like the WH1000XM3s support, and their inclusion would have made the Surface Headphones a better product. It’s not that the Surface Headphones sound bad without these codecs, but I did find that they sound unimpressive at best and lifeless at worst. Ironically, this issue is compounded by the fact the Surface Headphones cancel out noise. With near silence to focus on a song, their audio shortcomings become all the more apparent. As one example, listening to ‘Take The Power Back’ by Rage Against The Machine, the Surface Headphones display an impressive soundstage as Tom Morello’s guitar skitters distinctly between left and right channels. However, once the rest of the band joins the assault, there’s a distinct lack of clarity to individual elements. In a word, everything sounds muddled. On songs that don’t feature immaculate production, the Surface Headphones perform worse, but they don’t do justice to even beautifully produced albums like Radiohead’s In Rainbows. Elsewhere, the Surface Headphones perform significantly better. Watching movies and playing video games, I didn’t notice any latency issues. I have also yet to experience any cutout issues; in fact, if there’s something that’s especially impressive about the Surface Headphones, it’s that they’re absolutely tenacious when it comes maintaining a link to a source device. In my 900 sq. ft condo, I’ve been able to leave my Pixel 3 in my bedroom, walk to the complete other side of the condo and continue listening to a song or podcast without issue. Microphone quality was another highlight, with most people I spoke to over the phone noting that there was little echo when they listened to my voice. Specific criticisms aside, I think the Surface Headphones have a lot going for them. Moreover, it's easy to forget at times, but the Surface Headphones represent Microsoft's first ever pair of noise-cancelling headphones. Considered in that context, they're an incredible accomplishment, and I have a feeling the Surface team will hit it out of the park with their next pair of noise-cancelling headphones. Whether someone should buy them if they're in the market for noise-cancelling is a different question. By almost every measure, the Surface Headphones fail to unseat the WH1000XM3s as the current king of high-end noise-cancelling headphones. The WH1000XM3s are more comfortable, sound better and feature significantly better battery life. With both the Surface Headphones and WH1000XM3s priced at $450 CAD, the answer of which one to buy seems obvious. Cold weather performance may seem like a minor consideration, but it's something that tilts the question of whether Canadian consumers should consider the Surface Headphones over the WH1000XM3s. I've read stories of people in cold climates returning their WH1000XM3s because they become unusable in temperatures close to and less than 0-degrees celsius. There's something to said about dependability, especially for a product that costs $450. "There's something to said about dependability, especially for a product that costs $450"